Now the world is progressing much more in science and technology. This is the 21st century where the demand of the technology is more. Information technology made the world smaller and smaller because people can access the whole world from one part of the world. They can shop and get information of the world with one click. Our country Nepal is quite developing in Information Technology. 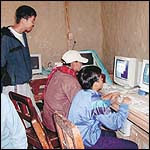 Nowadays in Nepal different college have started teaching information technology courses to the students. From these courses, student can compete with the international market in IT field. Nowadays, from class II computer education are given to the students in some schools. But the education system of our country is aged. The courses that have been collapsed from the international market are being used in our schools and colleges. To participate in international market, our education system should be changed and the new system should be raised. From class II to Bachelor level students get bored learning all this history, generation, computer system, and other replicating courses. The market based computer course should be taught in the schools and colleges, so that the unemployment problem can be solved to some extent. If the students get the market based IT course then they can even work in single PC at home and they can earn for their own. We want to suggest the IT education system of Nepal should be changed and new course should be started which helps the students like us to established our own IT career and work for the country and the unemployment problem of the country can be solved somehow by the youth of the country. Some universities should provide the online graduation course so that student can work while studying. Some of our college say that the student can study in morning class and work in day but after joining the college the morning classes run up to 12PM-2Pm and who will give part time job to those student who have to work and study by the money collected by their work. If such colleges run the online courses, student can learn the course while they are free from the work. We should change the education system of Nepal. If student cannot get the market based courses, how can they work in the market though the course they have learned. So we have to think about that unless the education system of the Nepal is modified, the economic and social status of the country cannot build up. yes you are right Navin bro. Its time to change our old syllabus and need to update it. According to current demand and marketplace. Actually, I also agree with this article. and the credit goes to Mr. Sudeep Satyal who wrote it. I've duly given him the credit and to read the credentials normally, I put that on next page after 'read more.. ' link. Having computer on every school is such a huge cost... did you think about this before? yeah, esp for developing or underdeveloped country, where their basic needs for food,cloth and shelter are compromised very often. There, dreaming to have computer is far beyond the expectation but still, .. there is light of hope.. at least we can try and have hope .